JACK RUSSELL TERRIER CLUB of GREAT BRITAIN - CLUB INFORMATION. The Jack Russell Terrier is a fox hunting dog, developed in England in the 19th century. There were terriers of all descriptions hunting earth dwelling creatures for hundreds of years before the Reverend John (Jack) Russell developed his particular "strain" of hunting terriers. The Reverend lived in the mid-1800's in Devonshire. He maintained his dogs with a certain body style and temperament best suited to do the job of fox hunting. Our present day Jack Russell Terriers came to be, solely by the efforts of this fox hunting parson. The conformation of the Jack Russell Terrier follows it's original function. Early British fox hunters used a black and tan type terrier, rather than the Fell or Welsh Terrier, whose colouring was too similar to the quarry it was hunting, namely, the fox. Difficulty in telling the terrier from the creature it was bolting out of it's den brought about the desire for a more white-bodied dog. In all probability the English Black and Tan Terrier was crossed with the Old English White Terrier (both now extinct) to achieve the type of coat and colouring we have today in our Jack Russell Terriers. To write and apply a breed standard (click here). The day to day running of the JRTCGB is the reponsibility of the National Committee (click here), which is elected annually at the Club's Annual General Meeting. This meeting takes place in November each year, it is held at a central location, is open to all members and is where any changes to the Club's Rules and Constitution (click here) are discussed and voted on with a view to their being implemented on 1st January of the following year. 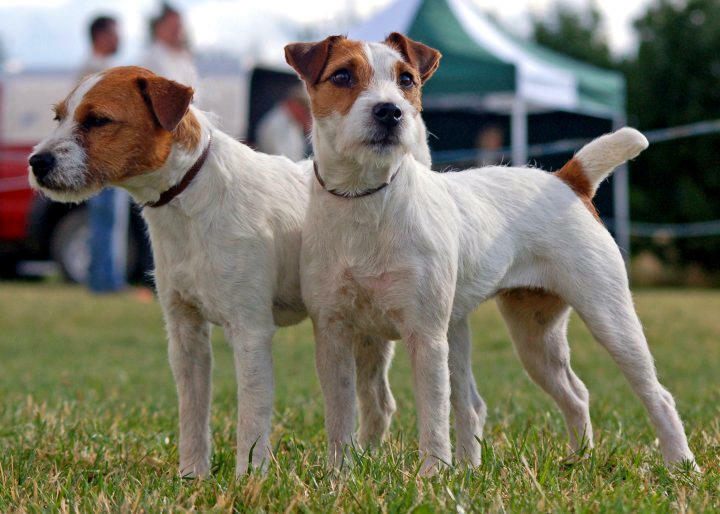 It is the aim of the JRTCGB to unite those people with a love and admiration of the Jack Russell Terrier, howsoever they may enjoy its unique and wonderful character. And to encourage and educate its members, both current and new, as to the importance of retaining the Jack Russell Terrier's working aspects and attributes, in order to continue the protection and preservation of this remarkable breed. America ~ Jack Russell Terrier Club of America (website). Canada ~ Jack Russell Terrier Club of Canada (website). Denmark ~ Danish Jack Russell Terrier Club (website). Finland ~ Jack Russell Terrier Club of Great Britain Suomi (website). Germany ~ Jack Russell Terrier Verein e V (website). ~ Deutscher Jack Russell Terrier Verband e. V. (website). Japan ~ Jack Russell Terrier Club of Japan. South Africa ~Jack Russell Terrier Club of South Africa (website). Sweden ~ Jack Russell Terrier Club of Sweden (website). Sweden ~ Jack Russell Terrier Club of Great Britain (Swedish Region) (website).